AcrEnergy’s plants are constructed using proven, modern technology. We work in the bio energy sector and in recent years we have been focusing on biogas. Biogas is gaseous fuel, predominantly methane, produced by the fermentation of organic matter, also referred to as anaerobic digestion (AD). upgrade it to produce biomethane or ‘green natural gas’, making biogas is a viable and proven alternative to natural gas. It depends on the infrastructure and local energy demand AcrEnergy can work with both types of energy generation. The plant itself becomes self-sustainable by using a fraction of its own produced gas for its onsite power and heat demand. 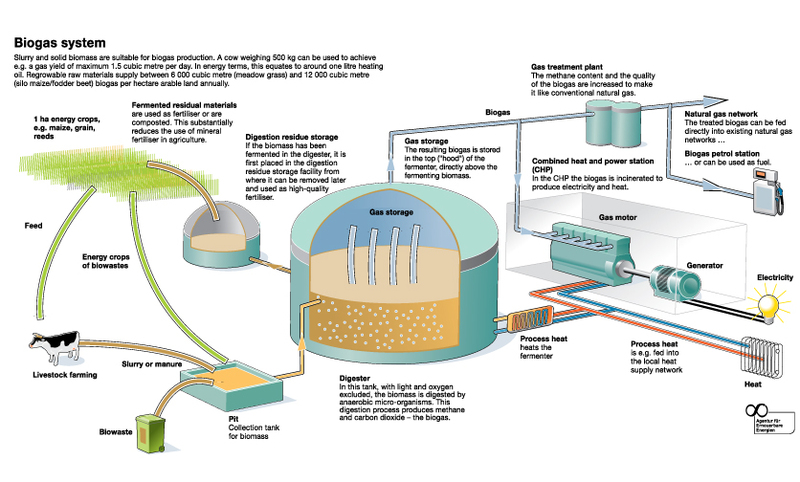 Unlike some forms of renewable energy, biogas plants do not depend on favourable weather conditions to generate energy. Instead they operate 24/7, like a conventional power station which compares favourably with other small scale generation such as solar and wind. When you factor in the continuous energy supply from biogas versus the intermittency of weather-dependent forms of renewable energy, the total cost of electricity generation for biogas are on a par with solar at about £32 per MW. The continuous supply 24 by 7 of biogas is referred to as base load. A plant has an average capacity utilization rate of min 95%, as biogas basically converts all its input to energy. In comparison solar converts maximum just under 20%, and wind about 40% of its input to energy. Applications of biogas are typically for small scale energy generation – also referred to as Decentralised Energy Generation or Distributed Energy Resource (DER) systems. It meets the entire demand throughout the year for communities in small towns and villages. In other words DER reduces the need to reinforce the power grid. 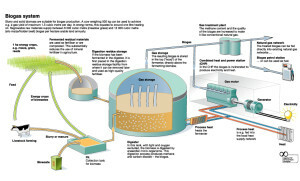 At plants where the biogas is used to generate electricity, heat is produced as a by-product. This can be piped to local customers via as district heating network to supply either hot water or heating – or both – for industrial purposes or residential houses. As of Nov 2015 AD already generates almost half of the UK’s renewable heat output. In Europe over 10,000 plants have now been operating successfully for more than ten years. Germany is by far the largest market with nearly 8,000 plants currently operational. In the UK as of October 2015 just over 400 plants are now in operation with just over 500MW equivalent total capacity. Biomethane makes up about one fifth with just over 30,000m3 per hour . AcrEnergy is proud to be a member of UK’s leading biogas associations Anaerobic Digestion and Bioresources Association (ADBA). Please refer to them for more in-depth information on the market drivers, constituents, legislative landscape and other useful links. We have only barely “scraped the surface” with 500MW currently operational. Latest projection by ADBA we have the potential to meet 30% of either gas or electricity demand. Alternatively, our biomethane production potential allows us to operate up to 80% of all HGV fleets in the UK. Agricultural feedstock with break crops and farm waste alone has the potential to power up to 1.3million homes in the UK. If we were to process all of the food waste in the UK the industry could produce 9TWh per annum by 2025 – enough gas to heat half of London’s households. Biogas production in the UK is currently mitigating 2.6 million tonnes of carbon from agricultural, food and and human waste. Going forward the biogas can reduce UK’s total greenhouse gas emissions by 4%. ADBA has prepared an MP Briefing Document for more information on biogas in the UK. Stakeholders of biogas plants present these sheets to our local MPs throughout the country.